Recently, at a gas station, I watched a guy pull up to the pump across from me, get out of his car, swipe his card, remove the hose from the pump, and then realize the fuel aperture was on the opposite side of his car. Now I am not passing judgment—he may have been distracted, or maybe he was borrowing a car from someone else—but, what he did next makes me think this tip wouldn’t have helped him much anyway. After discerning this wasn’t going to work, he puts the pump nozzle down on the pavement, gets in his car, drives away with his door held open, and circles back around to the proper position to pump gas. I am beginning to understand why some states don’t allow people to pump gas on their own. So the key to knowing which side the fuel aperture is on the fuel gauge. 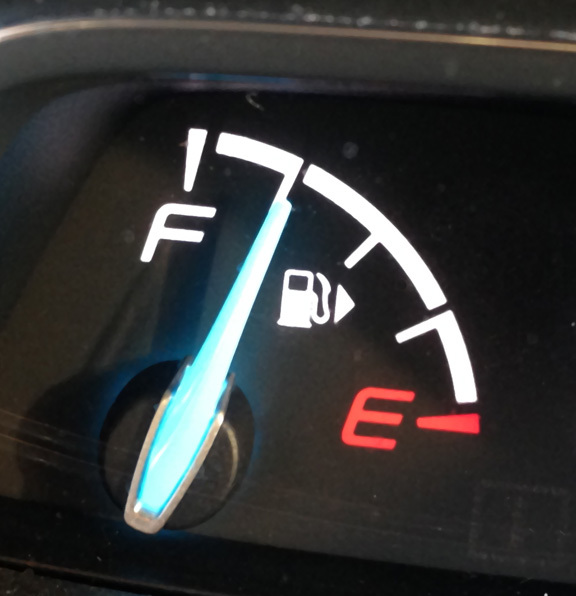 For most all modern cars, there is a triangle/arrow next to a fuel pump icon pointing either left or right—the side where the fuel aperture is located. So whether it’s a rental or a friend’s car, you can quickly glance at the gas gauge to see how you need to drive up to the pump. Now if someone loans you a 1969 GTO, you won’t find this icon, nor will you find the fuel aperture on the left or the right. It’s right where it should be—centered, nicely hidden behind the flip-down license plate—so you can pump gas from either side. By the way, if you know someone loaning out their GTO—let me know!